What would Zeus drive? It would have to be opulent, powerful, solid, and strong. And, it would be nice if it impressed the ladies, too. So, when Zeus comes down from the mountain, we suggest he head straight to the nearest Rolls-Royce purveyor and ask to see the Rolls-Royce Phantom Coupé. We recently were among a select number of journalists who got to see the first official unveiling of the Phantom Coupé. This newest Rolls-Royce model is set to debut to the public at the Geneva Motor Show on March 4, 2008. Production starts in the summer, with deliveries (Zeus, are you listening?) starting soon thereafter. An introduction by Tom Purves, Chairman and CEO of BMW NA, a fast beat on the sound system, dim lights, red uplighting on the walls…and then a curtain pulls aside to reveal Ian Cameron, Chief Designer for Rolls-Royce, driving the Phantom Coupé to within mere feet of our table. 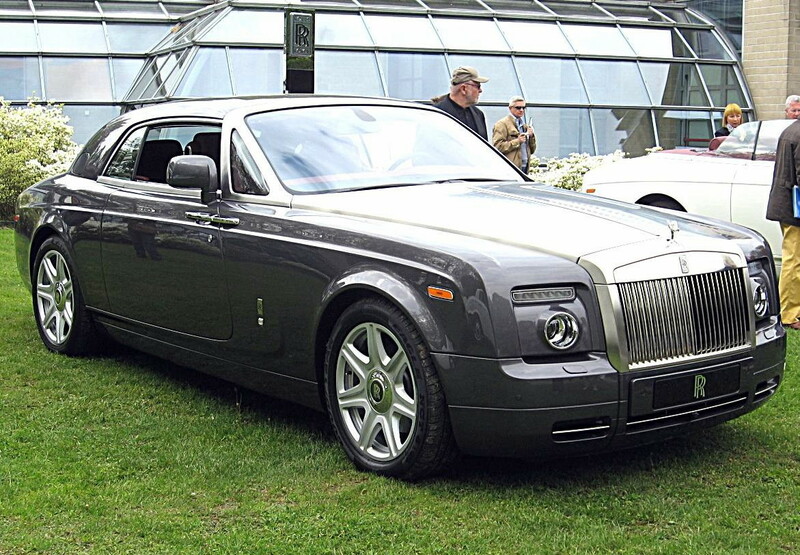 The Phantom Coupé’s exterior is classic Rolls-Royce. Understated, yet imposing, it features the traditional Rolls-Royce grill, rear-hinged coach doors, a brushed steel bonnet (hood) and A-pillar surround, and round headlights topped with LED bar parking lamps. At over 18 feet long, over 6 and a half feet wide, and over 5 feet high, the Phantom Coupé has an impressive silhouette. 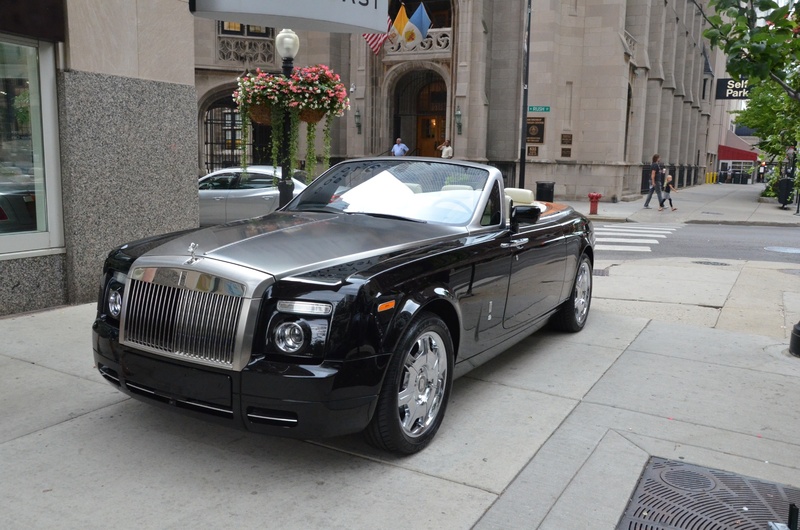 However, while it is almost as large as the Phantom sedan, it somehow doesn’t have that ‘limousine’ feel of the sedan, where you can’t imagine being anywhere but in the back seat of the car with a chauffeur in the front. Make no mistake–the Phantom Coupé is a driver’s car. Those unique rear-hinged doors open to reveal a lush interior. What seems like acres of hand-stitched leather and hand-rubbed wood surround you. Ingress to the rear seat is surprisingly easy, aided both by the size of the car and those rear-hinged doors. We push a button; the driver’s door closes itself. For a moment, we know the sense of power the gods must feel when they speak and a miracle occurs. We push another button. The analog clock in the center of the dash rotates backward to reveal a car information and navigation screen, controlled by a BMW-iDrive-like center console knob. We can’t figure out how to get the clock back, so it really does seem to be iDrive at heart. We look up. Van Gogh’s Starry Night comes to mind. The headliner of the Rolls-Royce Phantom Coupé is the most unique of any car we’ve seen. At the flick of a switch, hundreds of tiny white LED lights twinkle above us; we almost expect to see a shooting star. Any car which weighs almost 3 tons has a certain amount of inherent safety, with other cars noticing it and making way lest they be overrun. The Phantom Coupé has an advanced hand-made aluminum space frame with over 130 meters of welding that provides the core of the Phantom’s safety cocoon. Remember those rear-hinged doors we keep mentioning? Without the hinges in the front, the A-pillar struts are able to run uninterrupted to the very floor of the car, adding to the Coupé’s safety. How do you accelerate nearly 3 tons from 0 to 60 mph in under 6 seconds? With a 6.75 liter 48-valve V12 producing 453 hp at 5350 rpm and 531 lb ft of torque at 3500 rpm. The engine and 6-speed automatic transmission are electronically limited to 149 mph. Rolls-Royce very properly describes the ride of the Coupé as being ‘on the refined, comfortable side of sporty’ (please say this with a British accent)…would you expect anything less from this marque? Self-leveling air struts, new spring dampers, and lighter anti-roll bars (compared with the Phantom sedan) combined with the stiff chassis and 50:50 weight distribution make the Phantom Coupé an exceptionally well-handling car. Heavy components such as the engine and transmission have been mounted as low as possible in the chassis to keep the center of gravity low. To reduce unsprung weight, the wheels feature lightweight ceramic cores. Rolls-Royce thinks of everything. As we’re about to step out of the car, we notice a button inside the door opening toward the front quarter panel by our knee. We push it and an umbrella slides out of the front quarter panel into our hand. This snaps us back to reality. Mere mortals such as us typically only dream about owning such an automobile. But, Rolls-Royce is giving the opportunity to a select few privileged souls to own and drive the best the marque has to offer. We hope Zeus put his deposit down early; production is limited, and even with a price tag north of $300,000, we expect there to be no shortage of buyers for this chariot of the gods.